I am honored and lucky to work at Fremd High School – where great things happen every day, where students inspire with their eagerness to learn while teachers touch lives with their passions and knowledge. One particular week I feel blessed to be a part of is Writers Week. Founded twenty-three years by now retired English teachers Gary Anderson and Tony Romano, and now tirelessly run by English teachers Gina Enk and Russ Anderson, Writers Week is an annual celebration of writing during which professional writers, students and faculty share their stories to help us better understand writing and authors. It offers wonderful opportunity for students to make the connection between what we do in the classroom and the outside world they are preparing for. Writers Week always inspires my students to write more and I’m inspired write along with them! The following is just a taste of the many, many memorable moments that stick out in my mind of Writers Week 23. For a complete video archive of each period, each day, visit the Writers Week video archive HERE. Writers Week certainly inspired me to write more, and what better way to start than with Writers Week itself!! Months before, students are invited to submit their writing to share during Writers Week. Every year, many, many students stand bravely in front of the auditorium filled with their peers and teachers. One of my own AP Language students shared her Indian culture and passion for dance while a beautiful video of her recital played behind her as she read; and, another of my Expository Composition students shared a comical rhyming “roast,” as well as her “This I Believe” essay – two proud teacher moments for me! So many students disclosed bravely – one talked about overcoming cancer, another about getting over her grandmother’s death, another revealed she suffered from social anxiety while another shared her love for her favorite stuffed animal. Such courageous sharing going on! I’ve never seen a more polite, supportive audience of peers through all of this. Students shared lessons learned – one talked about finding that “firework moment” in which you learn and grow, one declared that bad days make good days even better, while another told stories from teaching preschool depicting how little kids say the darnedest things. One of the co-editors of The Logue, the school newspaper I co-advise, eloquently spoke of Muslim contributions to the U.S. and the fact that many are simply scared of what they don’t know . . to which she received a standing ovation!! Unbelievable, goose-bump moment! I could go on . . . . over fifty students spoke throughout the course of the five days. This year, students were lucky to here from a former student as well. Erin Dismeier, a 2009 grad and radio broadcast producer came to speak to students about writing for the radio, and how different that is. Students had a chance to hear a sampling of her actual broadcasts! It’s important for students to see the success of alumni who started out like them. In addition to the students, faculty takes part in the sharing. Virtually every department in the school has been represented with teachers sharing their own writing. It’s eye-opening for students to see that their science or P.E. or math teachers write too! This year, for instance, science teacher Brad Graba shared the importance of being scientifically literate, business teacher Brittany Seivers illustrated – through her own personal story – how we are all going through something but that’s what ultimately unites us, and world language teacher Andrea Fritz shared own writing inspired by her mom. And having her parents there was very touching for the students, I might add. Of course, it wouldn’t be Writers Week without English teachers writing: Eric Schaeffer shared a re-count of when he courageously took part in Running with the Bulls in Pamplona; Grant Dawson shared his two-week jury duty experience, English t.a. Torie Eldridge told about overcoming the death of her mom, Marilyn Berdick wrote a fun story about the Cubs (and sang! ); Jaclyn Han recited her own versions of Encyclopedia of Me and Russ Anderson wrote about sharing his love for the Cubs with his own children. The unbelievable amount of sharing going on during this week is like at no other school. Moreover, Fremd students have been lucky to have a chance to hear from three retired English teachers, coming back to share in the writing celebration. Gary Anderson, co-founder of Writers Week, has never missed a year of presenting. For his 23rd year, he bravely disclosed about his strained relationship with his own father. Tony Romano, co-founder of Writers Week, previewed a few chapters of his third, new book to be published, and Kevin Breuner recited one of his stories titled “Original Sin,” a story from his youth playing golf. The different perspectives the students gain about writing . . . about life . . . . is something they will remember for a long time. Mary Fons: Mary Fons is a regular Writers Week favorite. She is a writer, quilter, designer and teaches a storytelling class at the University of Chicago. Students and faculty alike adore and are inspired by her as she shares her knowledge of storytelling. I am especially impressed with her willingness to put herself out there, to write what she knows and feels and live with passion – this is fabulous for students to see! One challenge she offered students is to write lipograms, a composition in which the writer intentionally omits a particular letter of the alphabet. What a way to challenge the writing muscles! Rebecca Makkai: Rebecca Makkai is a fictional writer, with works including the short story collection, Music in Wartime and The Hundred-Year House, a novel about the secrets of an old-money family. She shared her own insight into storytelling and writing, pointing out that the best stories are ones in which characters change both internally and externally. Hearing a professional author talk about the story arc solidifies for the students what they practice within their own classroom writing. Taylor Mali: Taylor Mali has been to Fremd’s Writers Week numerous times but this was my first time seeing him live – and I left inspired! We read poetry in class, we have the kids write poetry but, man, to have them hear poetry being read from the poet himself is exciting for kids. Mali orally interpreted quite a few of his poems, including “What Teachers Make” (per the request of a student in the audience), and interestingly declared that teaching is a lot like poetry – both instruct and entertain. He’s got a good point . . . we’re not just there to teach the content but to relate to students in such a way that they buy in, that they see connections, that they see want to learn. AJ Pine: Amy Pine is a former English teacher at Fremd High School and a published new adult author of four different series of novels. As she herself indicated to her audience at WW, what we do in the classroom does connect to life outside – and what better way to see that then through the success of one of the student’s own former teachers. Amy talked about everything from the importance of digital citizenship to how to be disciplined enough to sit down and write a book. Tyehimba Jess: Tyehimba Jess, acclaimed poet and author of Leadbelly and Ollo, shared a number of his pieces, including a concrete sonnet, a sonnet that visually conveys the meaning of the piece the graphic arrangement of the words themselves, as well as an intriguing crown of sonnets, a sequence of sonnets usually addressing one subject or person. The preceding and succeeding sonnets are linked by repeating the last line of the preceding sonnet to the first line of the succeeding. What was most fascinating about Tyehimba’s sequence is that the sequence makes complete sense no matter the order of the reading of the sonnets: up and down, left to right, diagonally. Now that is a challenge . . . one of my colleagues was so inspired, he started to write his own sonnet sequence to his wife for Valentine’d Day. Jeremy McCarter: Jeremy McCarter enthralled students with the story of how his book Hamilton: The Revolution came into being born. As he stated at one point, ideas waiting to come out of our brains and into realization is like feeling “super pregnant” with ideas inside of us growing and waiting to become real. And while success may sometimes look fore-ordained, it’s not. What seems to come together well is only through hard work along with many trials and tribulations. McCarter recommends reading Stephen Sondheim’s Finishing the Hat for further writing inspiration. The premise of the book is “content dictates form” . . . we can’t prejudge how to achieve something until we know what we want to achieve. It is only then we can start to take the steps to achieve that something. So true. G Neri : YA author G Neri, author of the popular graphic novel, Yummy, spoke of the importance of reading fiction to gain empathy. Something he said that still resonates with me is “When you start to open up to opportunities, opportunity opens up to you.” This is so very true – the more open you are, the more opportunities come your way. Students need to hear this, and hearing it from someone other than their usual teachers makes it even more impactful. Joe Meno and Billy Lombardo: Joe Meno is Chicago fiction author and playwright; Billy Lombardo is a Chicago fiction author and educator. For two class periods, the two writers shared their writing and had a unique personal conversation about writing as they sat side-by-side on the stage. They asked each other questions before inviting students to do the same. Students thoughtful questions attested to the audience interest. The above are just a sampling of the many, many inspiring, impactful moments of Writers Week. I did not list every presenter, just a sampling. Every period of every day brought more learning, more insight, more inspiration for students and teachers alike. Day after day, students left chatting about what they just saw on stage . . . left inspired to write a bit more and inspired to read a bit more. Bottom line, Writers Week makes us all a bit more nice to each other, a bit more glad to do what we get to do every day in the classroom – share our own passions for reading and writing with our students. We are all connected by our love of travel! This year, my family splurged on an 8-day trip to Cuba for my mother’s birthday. I took advantage of the opportunity and planned for a unique educational exposition I would never forget! It’s an eye-opening experience to visit a third-world, underdeveloped country. It puts the modernized stress we place on ourselves into much-needed perspective. Everything in Cuba is contently old-fashioned. For instance, you won’t find an American car newer than a 1962 model (one result from the 1962 U.S. embargo against Cuba). Mind you, those cars are in pristine condition as pride in ownership runs rampant. As a high school English teacher, I was especially excited to visit Ernest Hemingway’s old stomping grounds and his home in Cuba, where he resided for more than 20 years. His sailboat, Pilar, that he fished on many times not unlike the protagonist in his novella The Old Man and the Sea, still sits decaying off a Caribbean coast. (Fun fact: Ernest’s widow, Mary, wanted to have it sunk so no one could use it again, but Cuban government red tape prevented that from happening). Where allowed, I took pictures to show my students. For instance, we spent quite a bit of time talking to the owner of Hemingway’s favorite restaurant, LA BODEGUITA DEL MEDIO, who explained how Hemingway’s family, including granddaughter Mariel, still come by when visiting Cuba. Interestingly, a Cuban resident who overheard our conversation that I’m an English teacher, proceeded to show me pictures around the restaurant of other Spanish poets who’ve frequented there. Just a great example of the congeniality of Cuba. They say everything happens for a reason. Now I know why I never read The Old Man and the Sea before . . . because I had to read it in its authentic setting!!! Let me just say that lying on a serene, peaceful beach off the Caribbean coast, staring at the very sea in which Santiago’s fishing adventures take place was awe-inspiring. For the record, Hemingway did not write Old Man in Cuba – he actually wrote that in another beautiful setting, the Bahamas. Nevertheless, living for over twenty years ten miles out of Havana had an impact on Hemingway’s writing. I will never forget reading that book in that location. Imagine what an assignment it would be to require students read a book within the setting illustrated within that book!! Safe settings only, of course. One of the main benefits of reading is our ability to experience faraway cultures we may not otherwise have the chance to. Besides learning more about Hemingway, our trip to Cuba included visits to Museum of the Revolution, breathtaking cathedrals, baseball games and music. We also took a 3-hour bike tour for a unique perspective of the outskirts of Havana. We saw military sites, memorial monuments, the Colon Cemetery (no pictures allowed! ), and dedicated parks and forest preserves. Obama loosened travel restrictions to Cuba in September 2015 and, in doing so, he expanded for travelers who have a humanitarian or educational purpose. We have to get visas, but that extra effort is worth it. The president’s visit to Cuba in March 2016 additionally lead the way for further congenial relations. Although the United States’ past relationship with Cuba may have portrayed the country as unsafe for travel, it is extremely safe. We talked extensively to Cuban residents and officials who reiterate that Cuba’s crime statistics indicate that it’s one of the safest countries in the world. We walked off the beaten path a few times and felt completely safe and welcome. Just brush up on your Spanish as English is not the dominant language. Communication outside of Cuba was a challenge. There is no cellular data. Wi-Fi is available only at certain hotels, and even that has many time and site restrictions too. Honestly, it was wonderful to see local people always socializing, always out and about, even very late into the evening . . . simply talking. No hunched shoulders behind screens!! One other small but very significant detail – travelers used to modern necessities need to bring their own of everything – and I do mean everything (toilet paper, anyone?). Stores are far and few between, and those that exist hold limited supplies; but, the local artisans selling their handmade unique art will make you forget the “necessities” we choose to spend our money on. The food was delicious and fresh. Cubans eat well with what their Earth provides. Seafood, sweet potatoes and plantains are plentiful. Who knows how Cuba might change radically within the next few years. Will pro-America slogans start to emerge? Will signs of capitalism bring more goods and services? Signs point to yes but I’m blessed to have had the unique opportunity to venture forth now, to experience Cuba at its most authentic. The world is our authentic classroom. I look forward to reading on plane rides. I have family on the West Coast so I fly frequently and like to make use of air time. 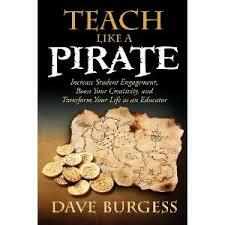 This summer, one of the books that renewed my motivation the most was Teach Like a Pirate by Dave Burgess. His candid, honest passion provided the perfect prelude to begin the new school year. While I never had the honor of meeting and attending one of Mr. Burgess’s seminars, I imagine he writes like he speaks because the book reads as if he were standing in the room enthusiastically cheering on his readers. I bookmarked, highlighted and noted a number of his sentences that I’ll undoubtedly refer to throughout the year ahead. The book is divided into three parts: In Part I. Burgess defines his philosophy, what the difference between passion and enthusiasm is to him, and how teachers can best utilize both to motivate students to learn. In Part II, Dave offers hooks to add to any content to raise student interest along with brainstorming questions to help teachers elevate engagement for even the most mundane lesson plan. In Part III, final instructions and thoughts are given to translate the words in this book into our own classrooms. Supplementary text, articles, videos and artifacts I am constantly on the lookout for new supplementary material for my students to study in conjunction with our main curricular units. Common Core advocates the use of mentor texts, and I cannot agree more. I recently started new Diigo and Feedly accounts to help me curate and keep track of resources. Blogging in the classroom. I enjoy blogging as a venue to share my own writing. This year, in fact, I was hired by my podiatrist to write professionally on his website. In class, this will be the fourth year incorporating blogging into the curriculum for my students. Each school year is a bit different, depending on the kids and what we are reading, but students always appreciate and benefit from writing for authentic audiences along with gaining those digital skills. See a previous POST on my blogging in the classroom experiences. Cooking – Preparing new recipes in the kitchen is therapeutic to me, and I read cookbooks from cover to cover as if they are novels. Over the summer, I purchased an Easy Bake Oven that looks very different from the one I owned as a child. I’m either giving it to my five-year old niece OR – if I get brave enough – bringing it to class to bake cookies during writing or reading sessions, to give students that fresh-out-of-the-oven comfort as they work. I originally spotted this idea in Alice Keeler’s blog post, “10 Easy Things to Try in Your Classroom in 2015.” Alice Keeler is a professional development educator I connect with on my PLN. These are just a few of the many new ventures I’d like to try this year. Reading Teach Like a Pirate renewed my sense of wonder and excitement as I contemplated new things to try in class to continually improve myself as a teacher. Educators, if you are looking for a book to renew your inspiration or energy, this is the one to read. I have yet to read a professional development book as passionate as this one. Go ahead, dare to walk the plank and teach like a pirate! The water below is with a school of eager souls who truly WANT to learn and be inspired. Two years ago, my school district began using Google Apps for Education (GAFE). Teachers are successfully using the suite of tools under various innovative capacities. I’ve been using many Google applications with my students for the past couple of years – mostly, to collaborate with student essays along with organizing my own documents. See HERE for materials from a beginning-of-year session I held at my school last August. For this upcoming school year, I’ll be setting up Google classroom for three of my five classes (for the other two, I will use iTunes U as I continue to have success with this platform tool). Alice Keeler and Libbi Miller, Ed. 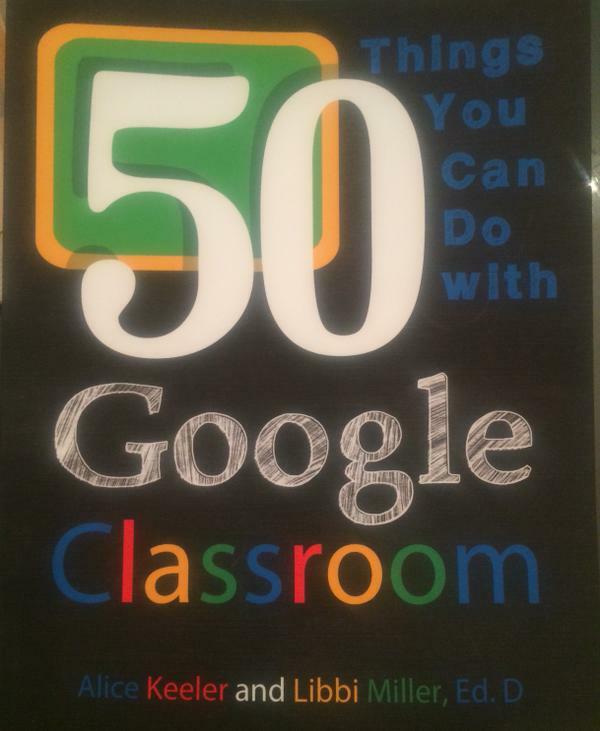 D.’s book, “50 Things You Can Do With Google Classroom” couldn’t have been published at a more opportune time. Google launched Google Classroom at the beginning of the last school year and, while I know many teachers had success with this from the start, others like me had some questions before initiating a brand new platform. My copy is already doggy-eared everywhere! What I like best about Keeler and Miller’s book is that it offers at-a-glance tips to do everything from setting up a classroom to utilizing advance features such as polling and linking to virtual office hours. Each of the 50 things to do include a clear, concise synopsis coupled with a screen-shot type illustration that visualizes the steps needed to execute the work in one’s own class. As stated in the introduction of the book, “Adding technology to our classrooms isn’t optional; it’s a must if we’re to equip our students for their futures” (xi). It’s books like this one that makes adding technology that much easier. This is a book I will refer to again and again. This is a book I’ve already referred colleagues to. This is a book any teacher using GAFE in the classroom will not want to be without. A+ for inspiration to incorporate more student-centered technology and effective instructional strategies!! Keeler, Alice and Libbi Miller Ed.D. 50 Things You Can Do with Google Classroom. San Diego: Dave Burgess Consulting, Inc., 2015. Print. My summer reading list keeps growing!! Create Compose Connect! Reading, Writing, and Learning with Digital Tools by Jeremy Hyler and Troy Hicks – Hicks and Hyler give new meaning to LOL – Learn Out Loud. The pedagogy they discuss and model for digital learning and connections in the English classroom is inspiring. I’m currently using the book review and corresponding movie trailer/comic strip as an independent reading choice book project with my freshmen. There’s so many more usable examples here – I can’t wait to try more. Write Like This – Teaching Real-World Writing Through Modeling & Mentor Texts by Kelly Gallagher . . .I actually purchased this when it was first published a few years ago but am re-visiting it this year. I use writing exercises in here as supplements to “hook” my student writers, to help them understand the connections between their academic writing and the “real-world” writing they will be performing beyond school. I appreciate Gallagher’s sensible ideas. They Say, I Say The Moves that Matter in Academic Writing by Gerald Graff and Cathy Birkenstein – I’m intrigued by this one. My department chair recommended it – I see use of this on all levels that I teach. Templates for helping students understand the rhetoric of argument is arguably doable. Articulating sound arguments with supported evidence is such an essential life skills – each year at school, students need practice with this. “Uncovering Substance: Teaching Revision in High School Classrooms by Jessica Singer Early & Christina Saidy in Journal of Adolescent & Adult Literacy . . . I’m continually looking for ways to revise the way I teach revision. Revision is an integral part of writing, and I don’t want students to think it’s just one more step they need to go through the motions to “get the grade” on their essays. Reflection is key for learning and growing, and students should master this essential real-life skill before tackling greater writing experiences. “Seven Reasons for Standards Based Grading” by Patricia Scriffny in Educational Leadership . . . My principal and assistant principal spoke about this very recently. While I’ve heard and read about SBG before, it makes more and more sense to me as we move forward. I’m still wrapping my head around it, learning and trying – articles like this one make the theories and applications more clear. The Art of Social Media – Power Tips for Power Users by Guy Kawasaki & Peg Fitzpatrick – As an educator, I’m very interested in ways we can use social media to impact student learning. I truly feel, when planned carefully, student interest and habitual use of social media can be channeled in a way to further understanding of class content. As a blogger, I’m intrigued on ways to “brand” oneself to gain significant connections with others in your professional fields. Journalism Education Today from the Journalism Education Association . . . I’m anxious to read my first copy of this! I recently added this membership to my list of professional associations as I’m thoroughly enjoying my first year with my school’s newspaper. This is another great way I get to fulfill my passion for digital writing, media, p.r. and journalism! 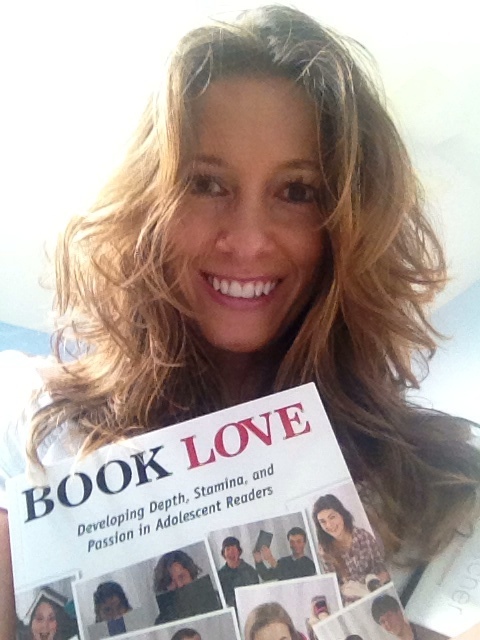 BOOK LOVE by Penny Kittle is a book I refer to again & again for reading strategies to help students love to read. Check the book out for ways to increase stamina in kids’ reading habits. Enter your email address to follow Theresa L Christensen via email.